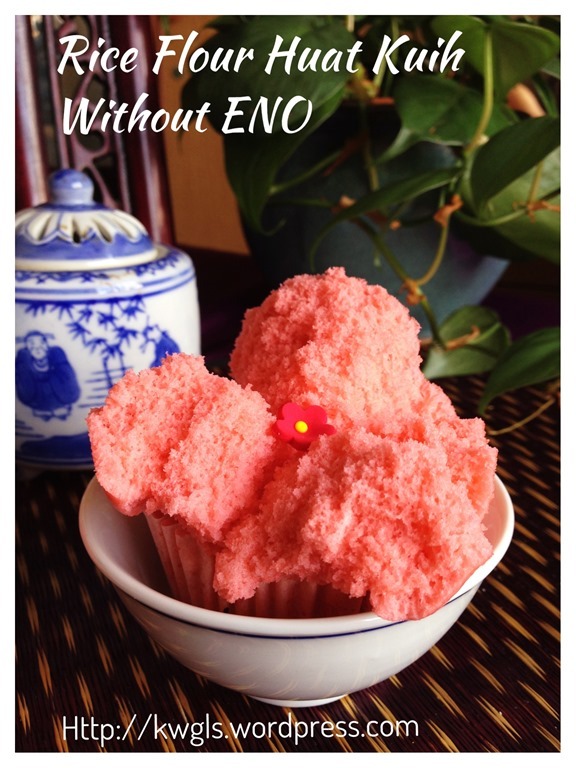 FOR NON –ENO RICE FLOUR HUAT KUIH, PLEASE SCROLL TOWARDS THE END OF THE POST. 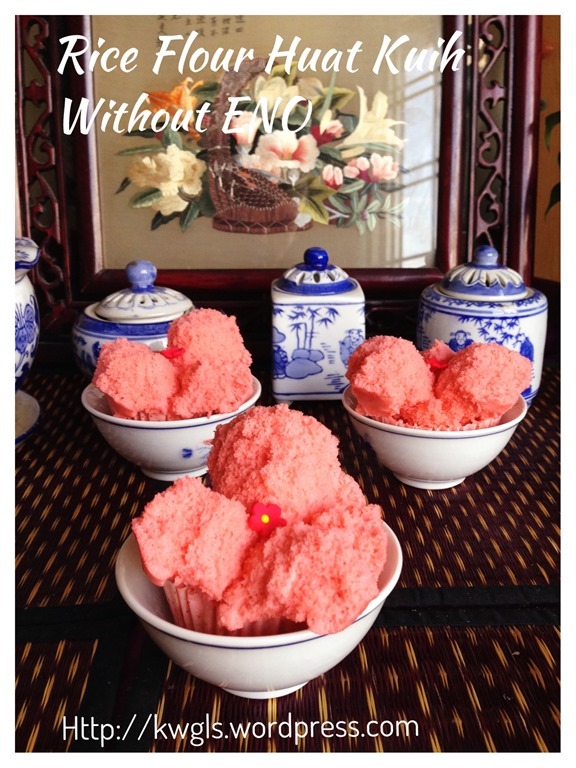 I am writing this post with due respect to my late mom and Chinese traditions. 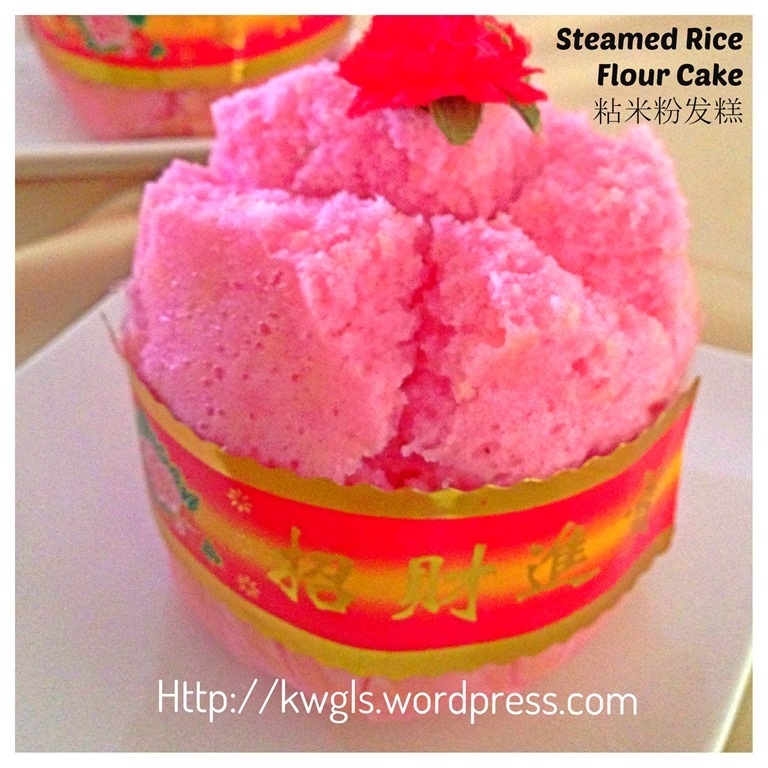 The name of this steamed is Chinese steamed rice flour cake (hereinafter to refer to as Huat Kueh) or in Mandarin Fagao (发糕). 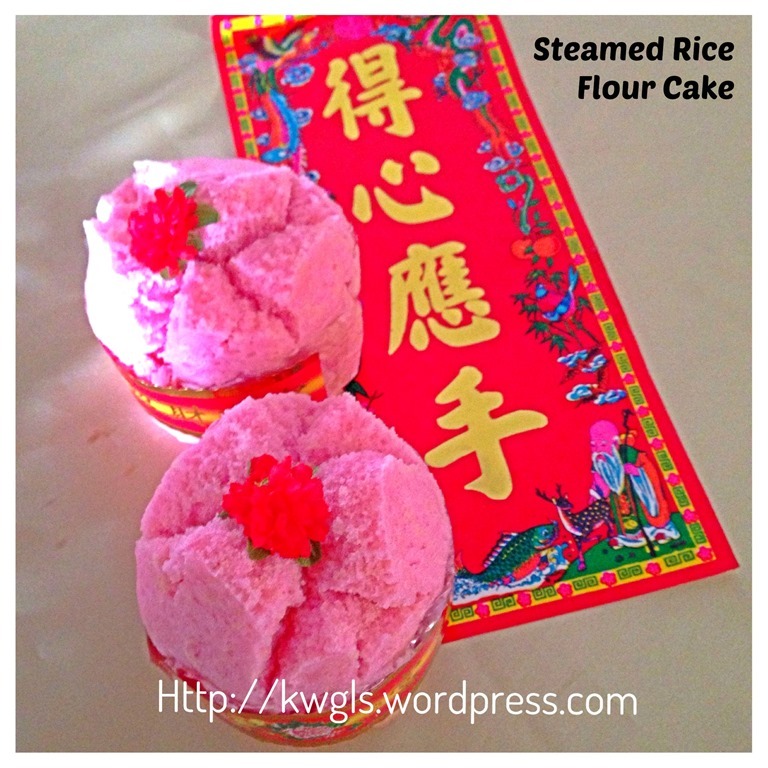 There are two types of Huat Kueh, one type is using wheat flour and another type is using rice flour. 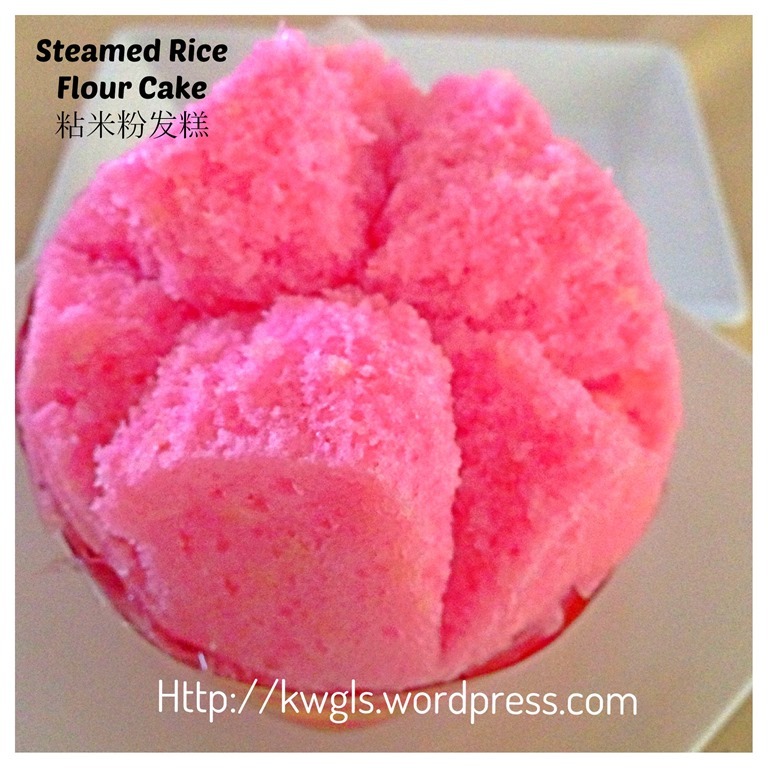 This post is the rice flour version of Huat Kueh. It is a very simple cake basically using only 4 ingredients – flour, water, sugar and leavener (either natural yeast or baking powder or baking soda). 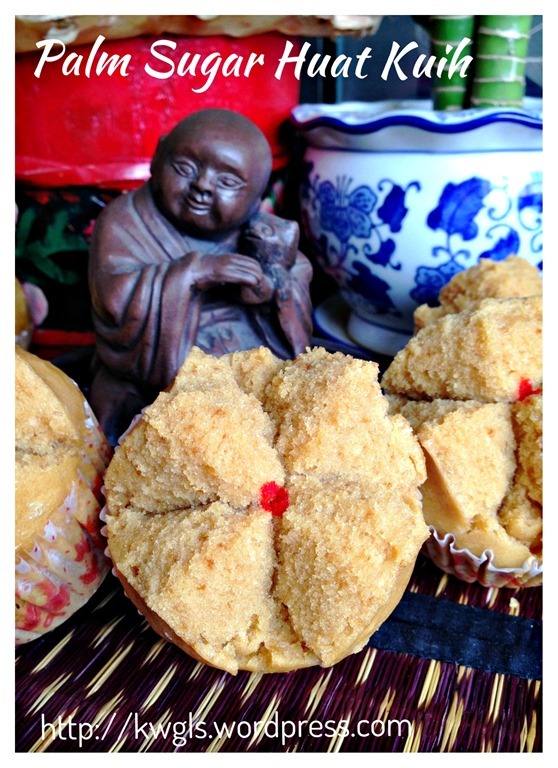 Since this cake is pure vegetarian (and in fact gluten free), it was usually used as an offering in both the Buddhist and Taoist temples. In addition, it is a common offering item to the ancestors. 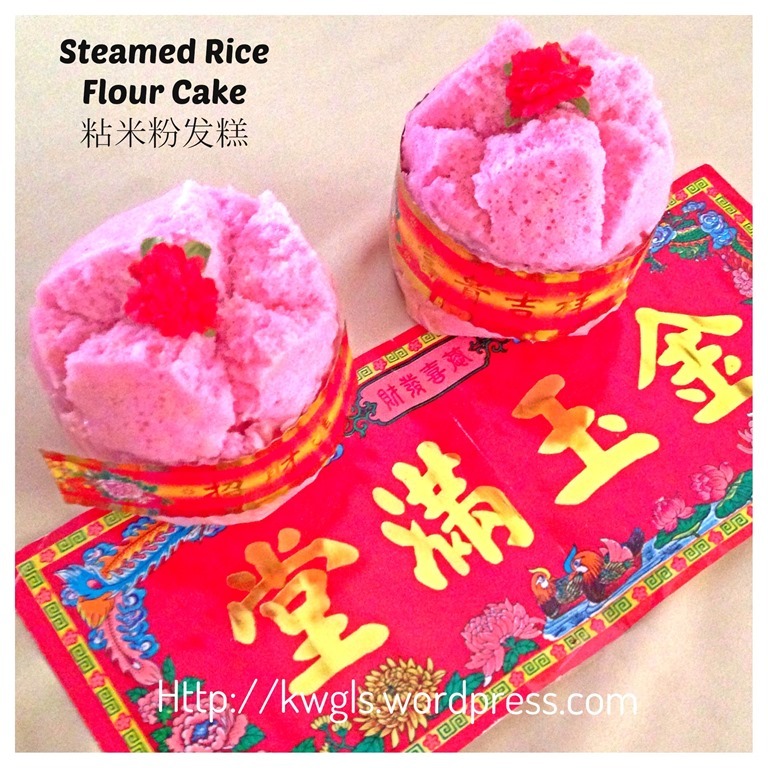 Practically, the steamed rice flour cake was offered because the cake can be kept longer and not turning bad due to its simple ingredients used. 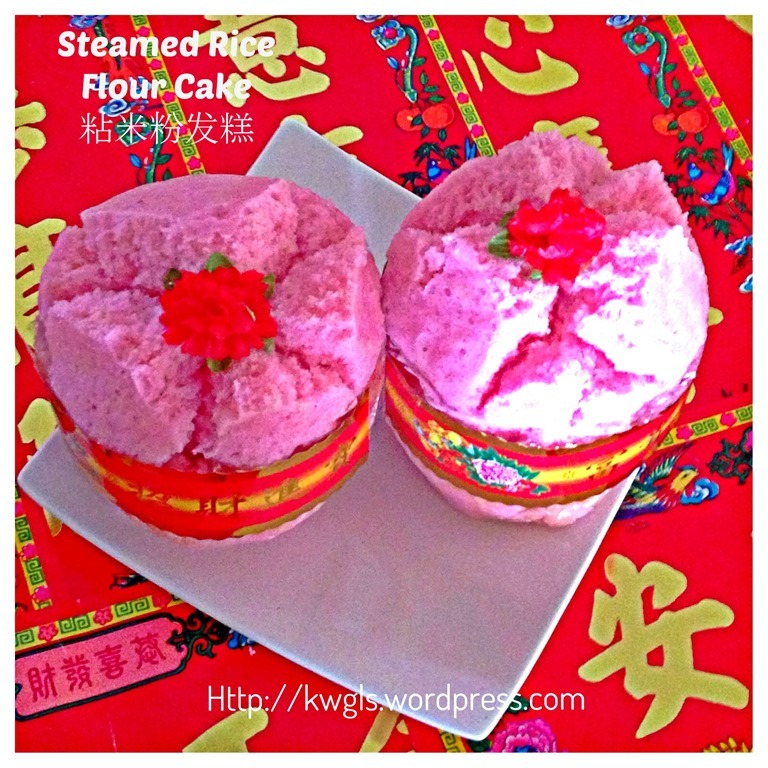 As similar with the Chinese steamed sponge cake (kuey neng ko), Chinese hoped that the cake will crack or smile beautifully. Cracking signifies joy, prosperity, resembling a flower that are full of hopes and looking forward for a brighter tomorrow. Therefore, in the olden days, there are lots of taboos associated with the preparation of this cake, including no quarrelling in the kitchen, no unlucky words said, no peeping into the steamers etc.… etc.…Even until today, I still have this pressure when I am preparing the cake, fearing that the cake may turn out “bald headed” which to me, is a sign of unluckiness. Well, may be I am overly superstitious. It was written in a rush and I do not wish to amend it today, so there are a number of grammatical mistakes above. Basically, I am recalling how my mom prepared this cake. In the 1960’s-1970’s, my mom usually prepared these cakes for offering to the ancestors or Gods. She soaked the rice, ground them using a big stone mortar assisted by my brothers. 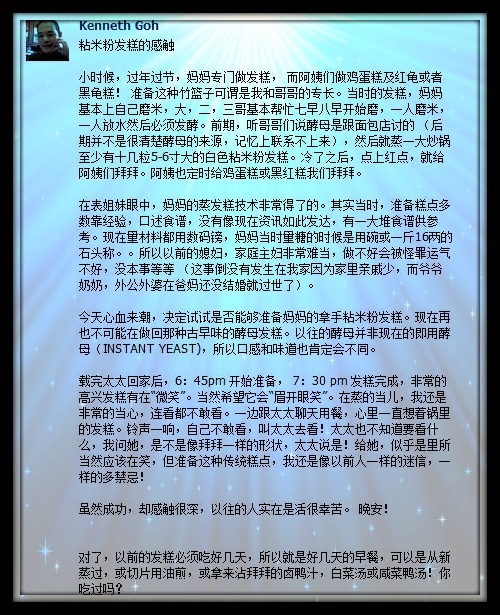 She then proofed the batter using the leavener (natural yeast) obtained from the bakery shop. There were no written recipe and she learned the preparation from words of mouth. She prepared based on her observations and experiences. I still remember that she used the traditional weighing scales or balance to weigh the sugar and used bowls to measure the water. My brothers and I will help her to put white papers onto the bamboo basket and throughout the steaming process, we were not allowed to talk non-sense and the best were out of the kitchen. Therefore, preparing this cake really bring fond memories and have a significant meaning to me. 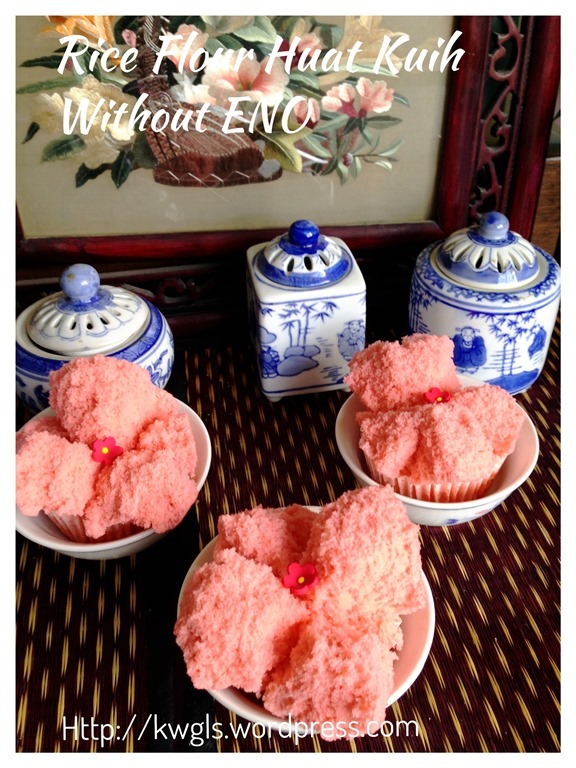 Yes, this quick version of Huat Kueh is using Eno (baking powder) as the rising agent as contrasted to what my mom had used – Natural yeast that have higher chances of failure. 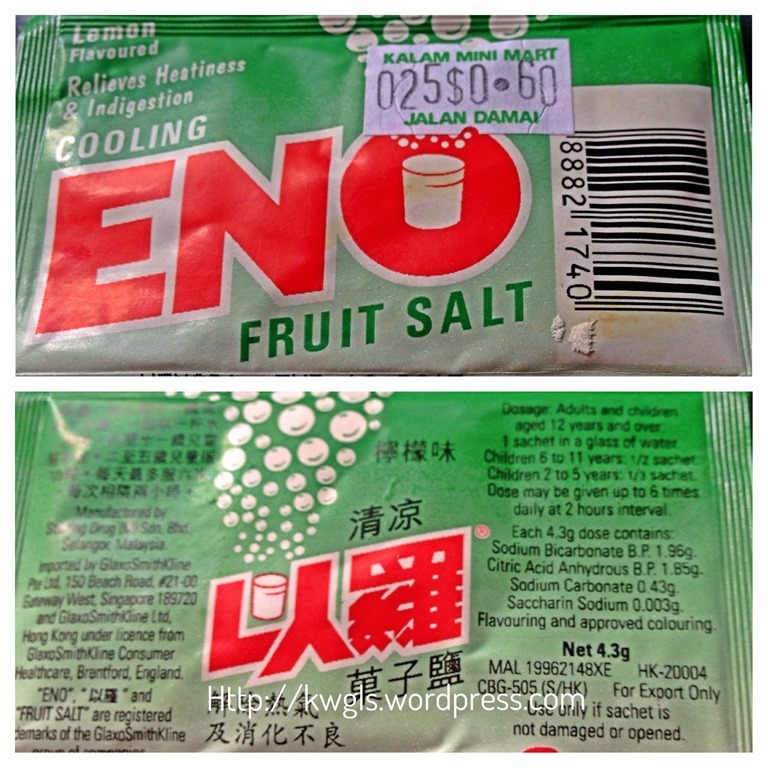 If you examined the ingredient composition of Eno, it was written that Eno was made up of citric acid, sodium bicarbonate (in fact it is baking soda), sodium carbonate and some permitted colouring and flavouring.. Therefore, logically speaking, if Eno was not used, baking powder and/or baking soda will definitely be able to provide a happy smiling face for this cake. Just like what my mom had done, I have used the traditional bamboo basket to steam the cake. There is a reason of doing so. It is easier for the heat to penetrate and cook the cake. 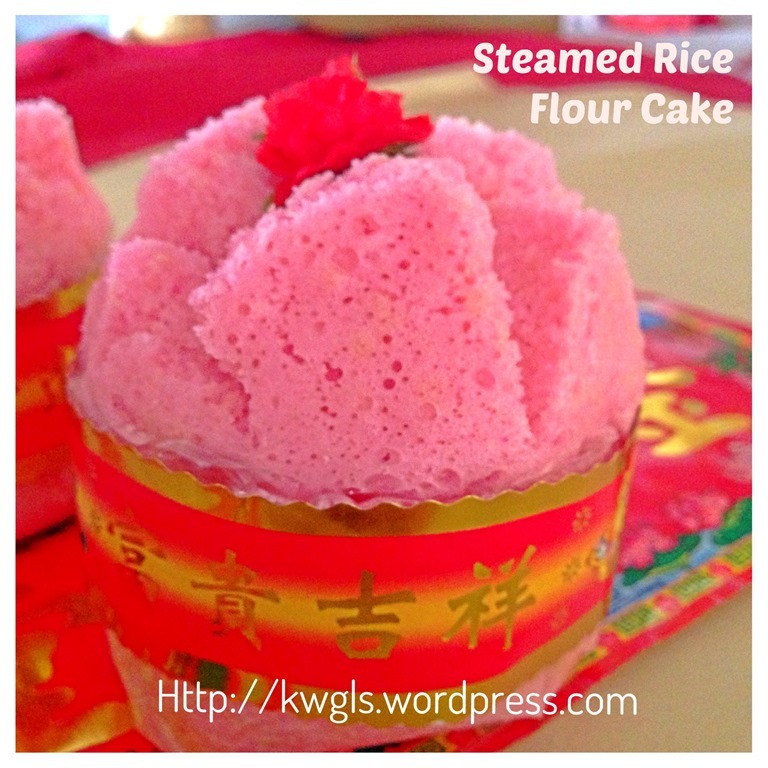 Personal experiences of steaming Chinese cakes shows that the use of bamboo basket had a better chances of getting a smiling cake then using the aluminium baking tin due to stronger heat absorbed. It is getting rather long winded and do try this recipe if you need to prepare this cake in a hurry. I would think, chances of failure are rather low. Some cellophane sheets (for cooking purposes, not in picture). 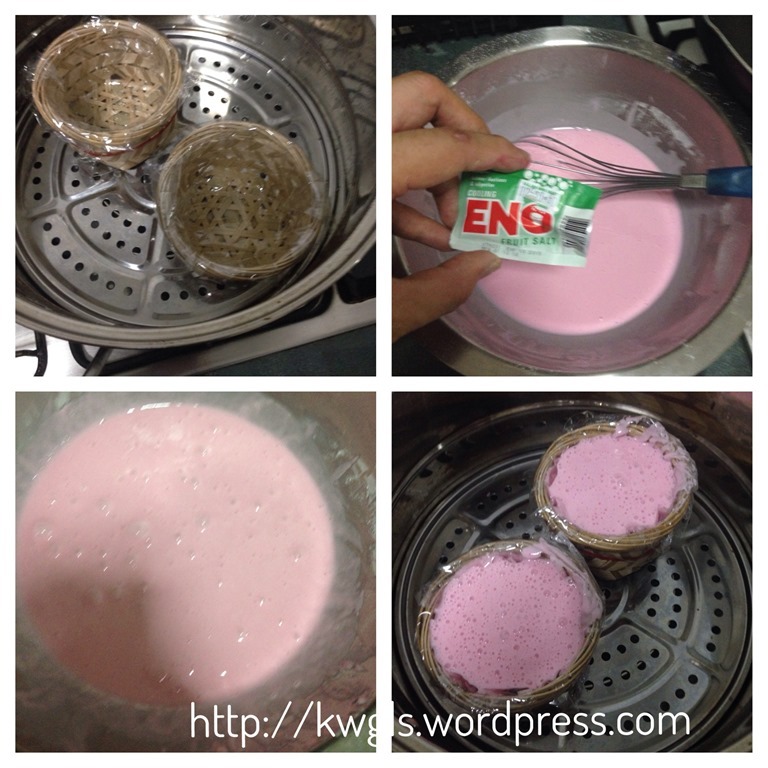 Waterproof baking paper can be used. 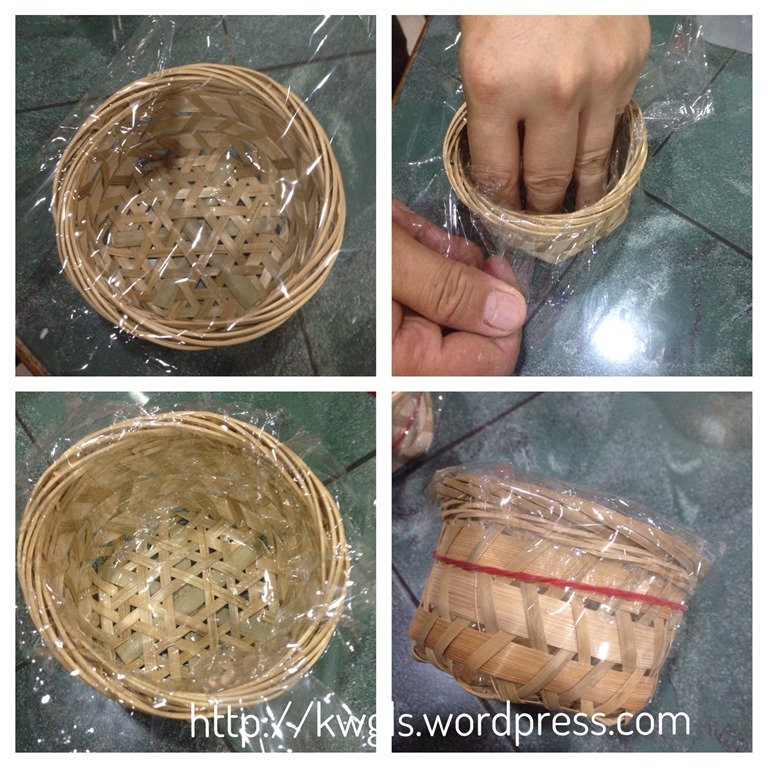 For the bamboo basket, put a piece of cellophane sheet on top. Push down the cellophane sheet into the bamboo basket as deeply and as close to the sides as possible. Use a rubber band to tighten the side. Sift the rice flour, baking powder and icing sugar into a big mixing bowl. Add water and permitted food colouring, stir well . Scrape the sides of the bowl. Meanwhile, steamed the bamboo basket in the steamer for at least 3-5 minutes. Just before transferring the rice flour batter to the bamboo basket, add Eno fruit salt. 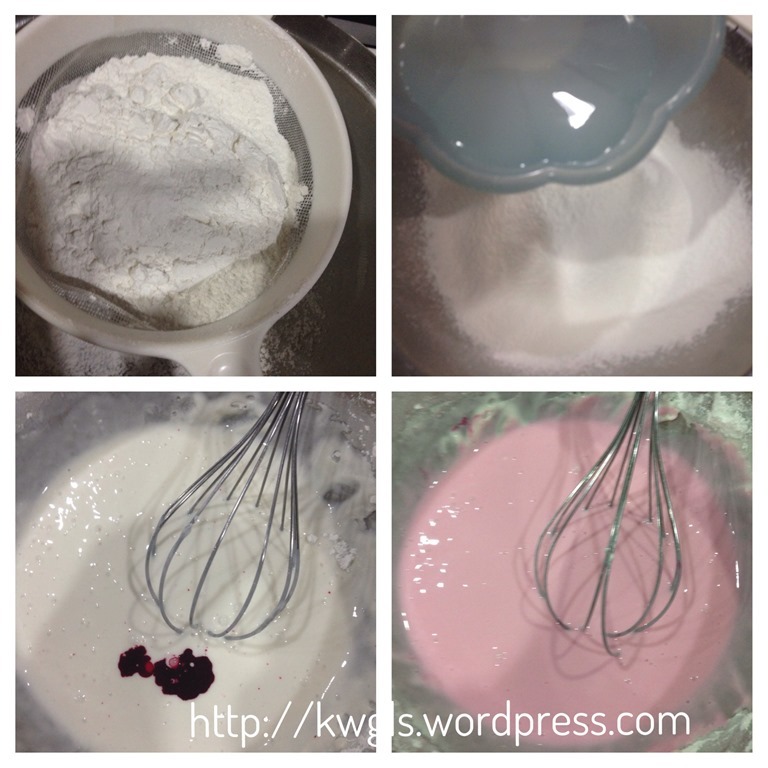 Use the balloon whisk to stir until well mixed. 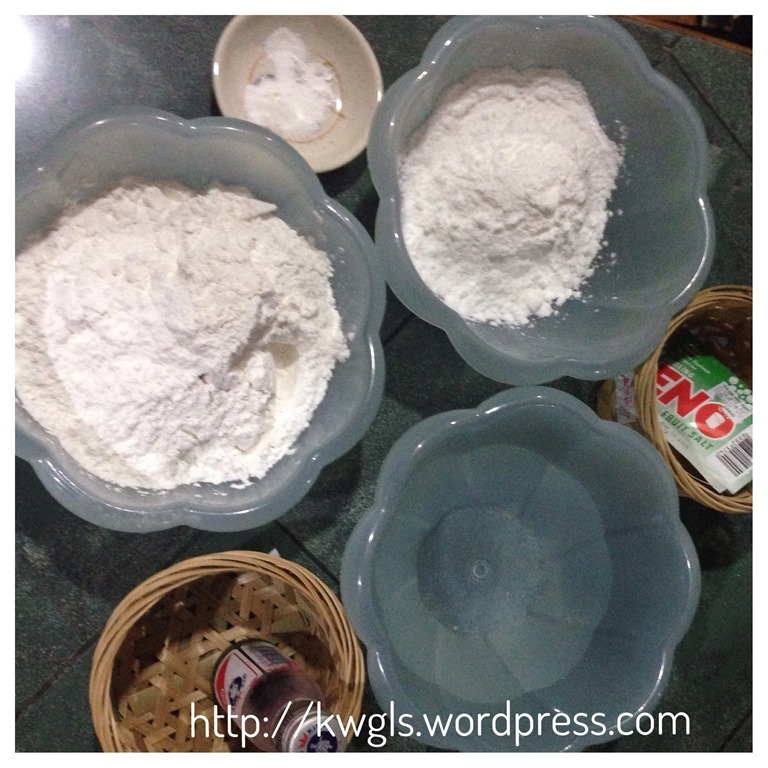 Transfer the batter to the bamboo basket. Steam in the steamer (using high heat) for 15-20 minutes or until a skewer inserted into the middle of the cake comes out clean. When out of the steamer, take the rice cake out of the bamboo basket and let it cool completely. For serving, cut into slices either eating it plain or with any of the breakfast spread. It can also be coated with eggs and pan fry with butter. 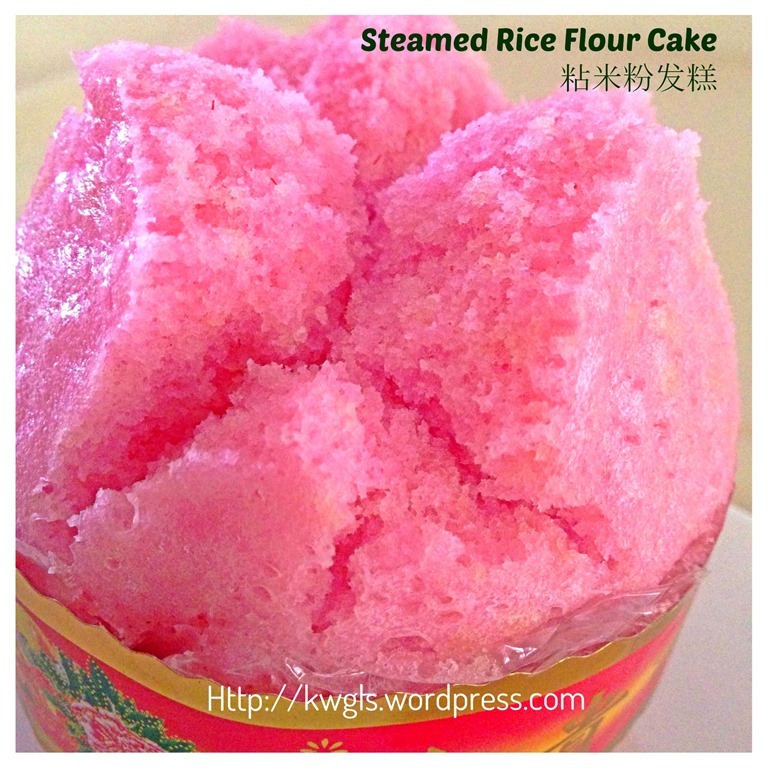 Steamed the cake on the next day if it becomes dry and hard. Preparing this recipe brings fond memories. I am happy with the outcome that it smile though I have hoped that they had “laugh happily with their mouth wide open” (refer to the image of original recipe above). Lastly, I am going to end my post with this unusual sentence :”Don’t throw away food, this cake is edible be it for gods, ancestors or human beings”. 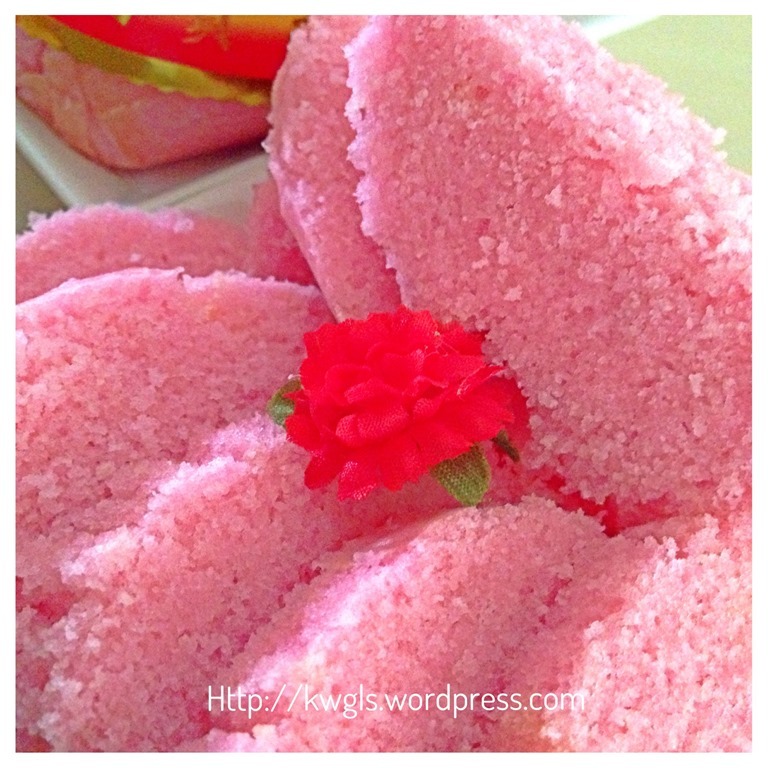 I have said this because a lot of people throw away offering item as it is considered as tasteless or other reasons… But as this cake is only made up of rice flour, it will taste like rice, how you make it tasty will depend on your creativeness, may be pan fried with butter or spread with coconut jam… Hope you like the post today. Cheers and have a nice day. As some of the readers residing overseas are telling me that they do not have assess to Eno or fruit salt, what can they substitute with. I told them since Eno is made up of critic acid and sodium bicarbonate, I believe baking soda can be used to substitute. However, that had never been confirmed. 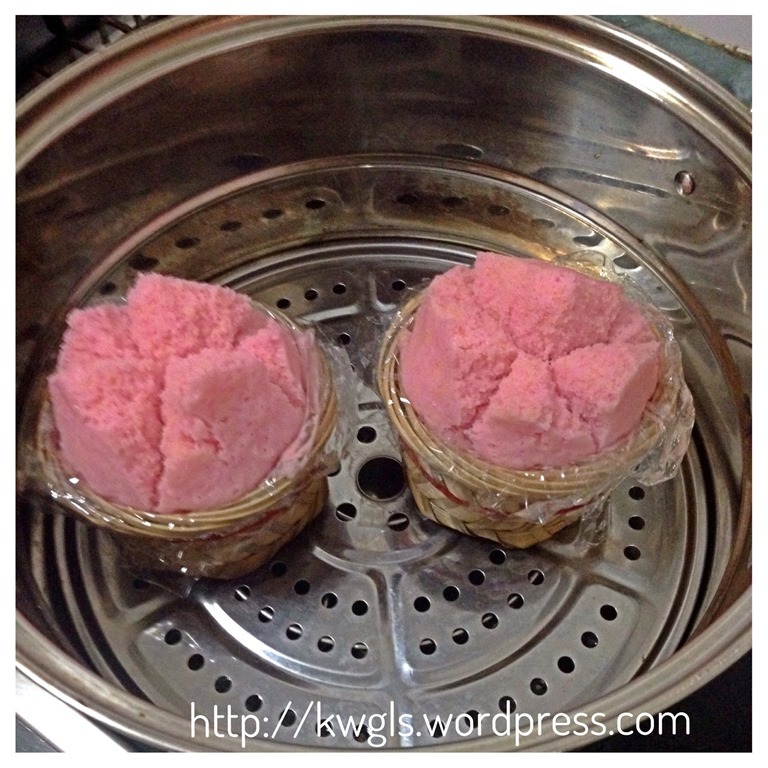 Today, I have prepared some rice flour Huat Kuih without the use of Eno. All procedures shall be the same as the above. It is advisable that pre-heat of cupcake mould is necessary. In addition, add the baking soda and baking powder at the last stage just minutes before you pour to the pre-heated cupcake mould. 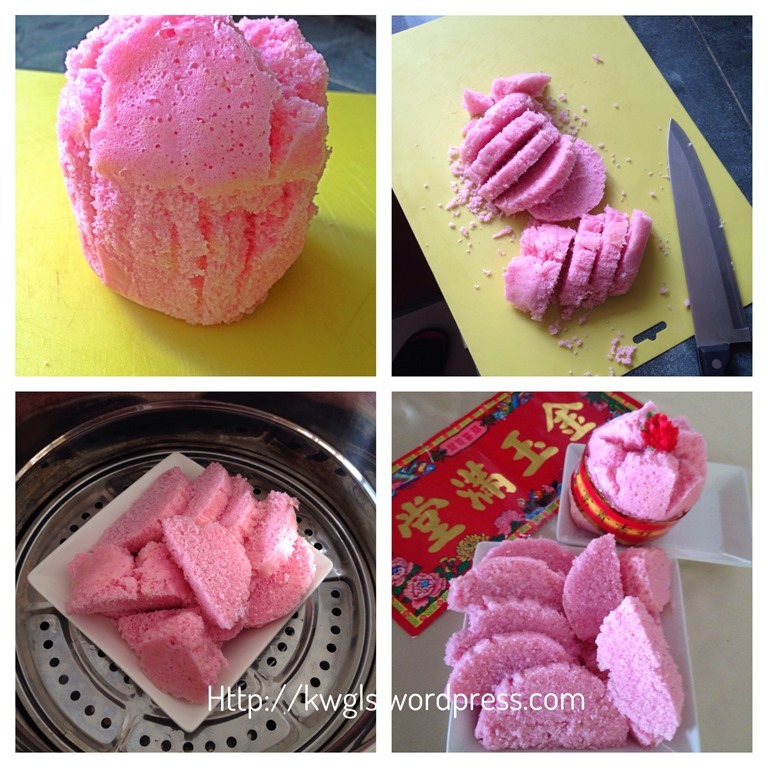 This entry was posted in Chinese and Asian Cakes and Snacks, Food Preparation Series and tagged 8, Chinese Steamed Rice Flour Cake, 粘米粉发糕，发糕, GUAI SHU SHU, Guaishushu, Huat Kueh, huat kuih, Huat kuih without eno, kenneth goh, postaday, rice flour huat kuih. Bookmark the permalink. This is so pretty and I’ve never seen anything like it! 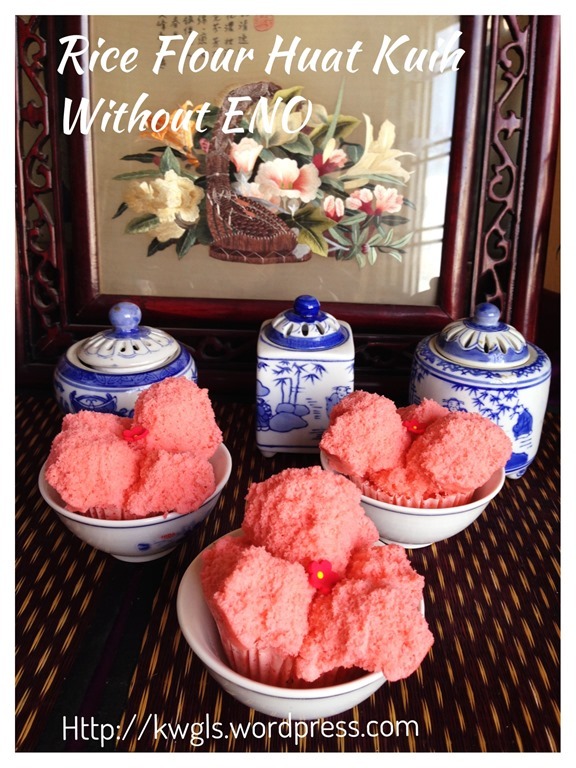 Thank you for sharing your memories and how to make this lovely cake! Pinning and have a wonderful day! I love the color of this. It is so pretty. I would almost have a hard time eating it because of how great it looks. This is so bright and pretty plus it sounds good! Thank you for sharing your traditions and memories on the Four Seasons Blog Hop. This looks amazing. You get such great colours! Can I ask where to get the bamboo basket in Singapore ? Pretty kuehs!! 🙂 Many thanks for sharing! Thanks for your compliment. It should be in between gluey and watery. 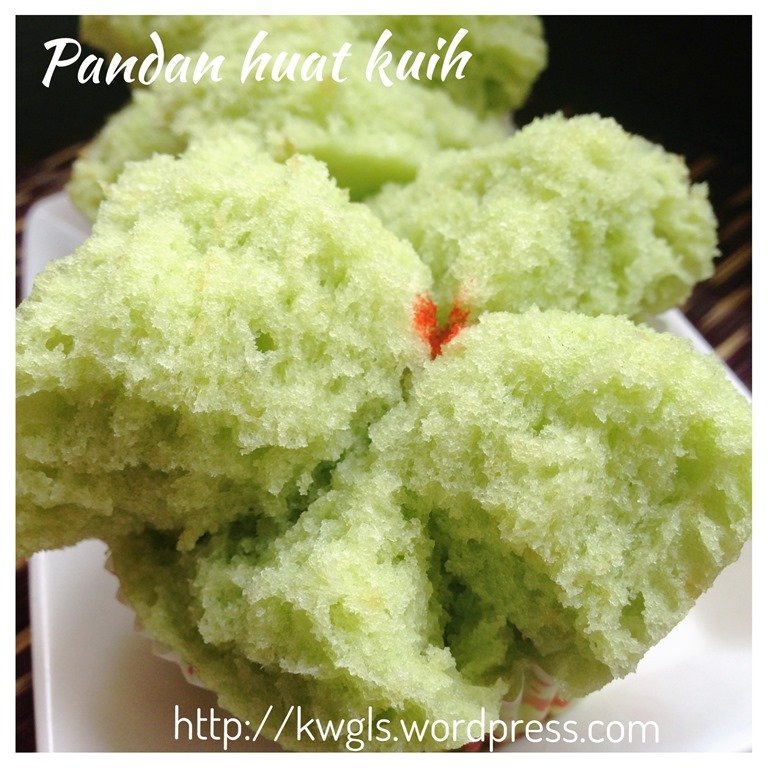 Is this the huat kueh that u eat with fresh coconut? Use to eat them when I was kid. Very pretty, can I ask where you buy the red flowers and decorative paper for the huat kueh? I can’t recall. During Chinese New Year, at times they do sell here and there or temporary stores…Sorry about it. Love your blog. It’s so detailed and informative. 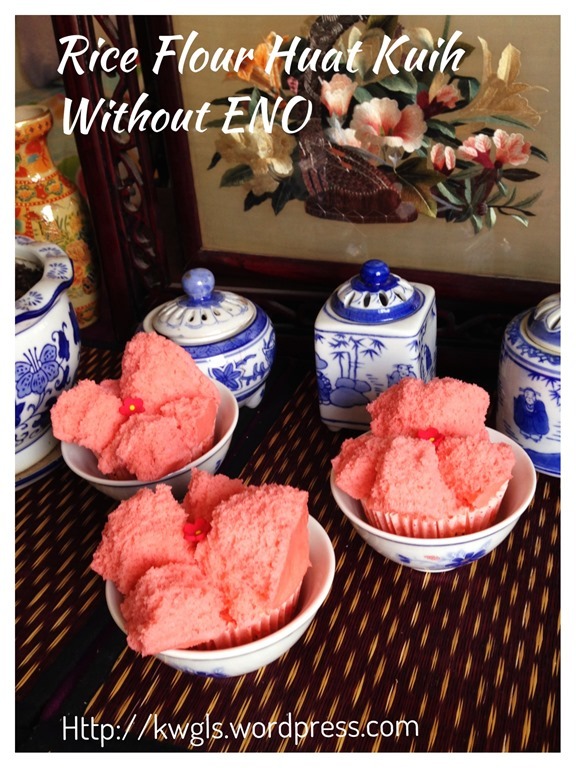 I have always want to try making huat kueh but can’t find eno salt in the Philippines. 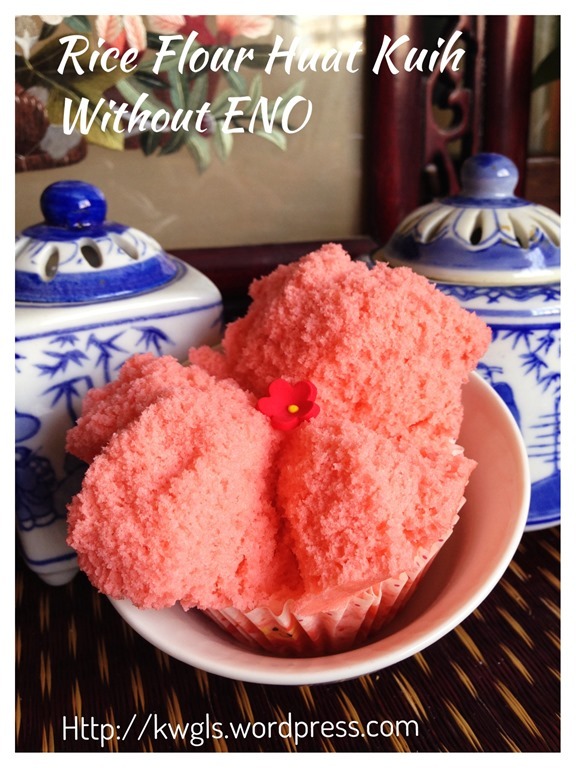 When I found your recipe without eno, i tried to make this but the huat keuh didn’t smile as much and there’s a bitter taste to it. Wonder what went wrong? Hope you can help me with this as this is one of my husband favorite food to eat. Hi Kenneth, I like to follow your recipe. 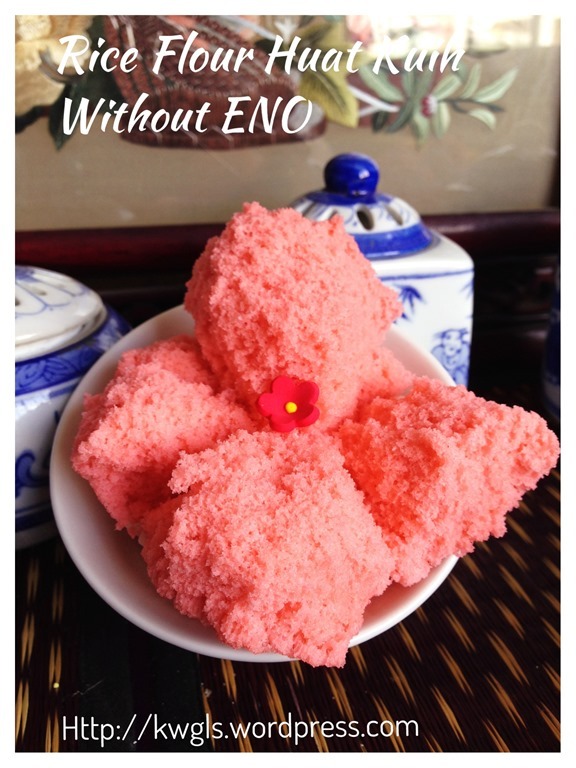 I tried this huat kueh using without ENO but i dont know why the top part where flowers is soft and fluffy while the inner part inside the mold is hard and dense. I wonder anything wrong with it. Im using silicone cupcake mold here and steam on a wok. I would like to request the Huat Kueh with toddy that sell in the market for prayer. I have try many times but come out flower. That mean no Huat.. Thanks you. I thought with flower is huat? 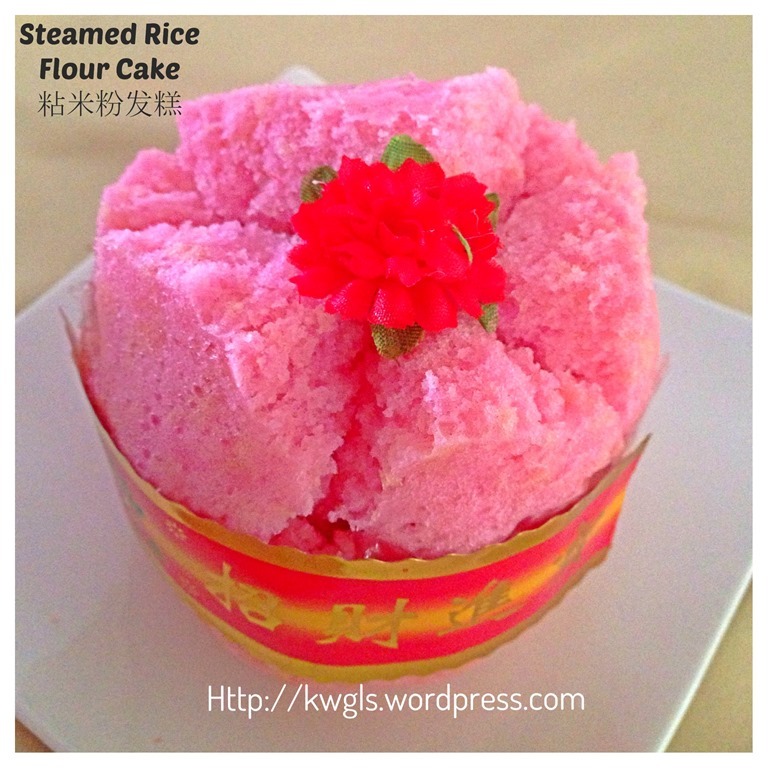 In singapore, i have difficulty to get tody and therefore I do not have such a recipe. Thank you. 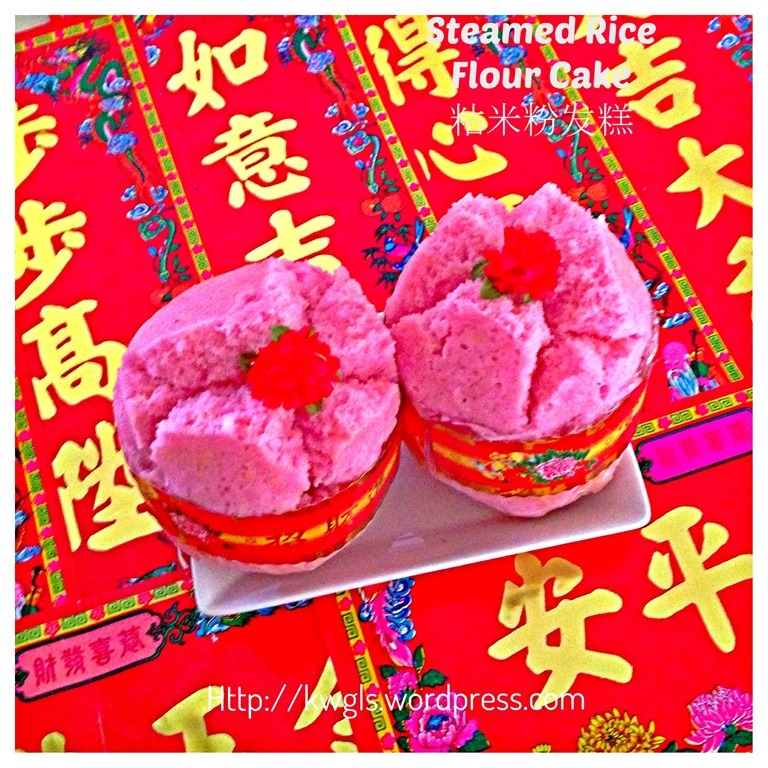 Just wondering if you have recipe for eggless huat kueh using plain flour?